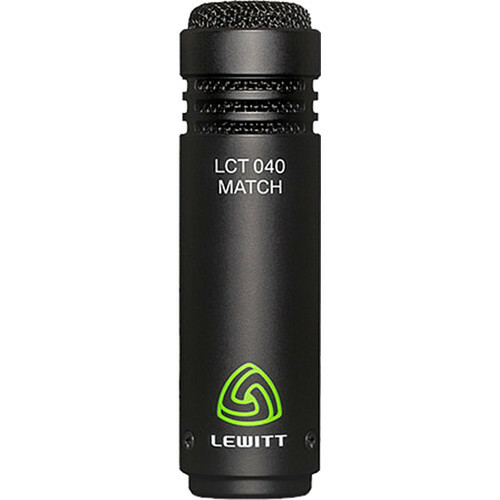 The LCT 040 MATCH Small Diaphragm Instrument Condenser Microphone from Lewitt delivers an excellent transient response to retain the natural ambience of your acoustic instruments. It can be used to capture audio for guitar, bass, percussion, or other instruments and portrays the real essence of your performance during live stage or recording/studio applications. The microphone is durable yet lightweight and is equipped with a cardioid polar pattern. It is built with an aluminum housing and requires 48V of phantom power to operate. The 3-pin gold-plated XLR connector ensures a reliable connection to your mixer or preamp. The LCT 040 MATCH Small Diaphragm Instrument Condenser Microphone includes a foam windscreen, a microphone clip, and a transport bag.